And here we go with another mysterious African test pressing. The last test pressing, although not yet officially identified, brought about some thoughtful conversation in the comments section, especially from well-known author and scholar Professor John Collins, who graciously found time to stop by. This time, we’re moving to another part of the continent. One listen to this wonderfully easygoing track with its marabi feel, its percussion, piano, and concertina accompaniment, and it is clear that we’re in Southern Africa. However, as with the last test pressing, we’re left with very little to identify the record. Yet, I believe we can get very close to this one – it may all come down to that terribly arcane study of the matrix number. Think of the matrix number as the “unique identifier” for each side of a record, stamped in the dead wax of the 78. As I described in the last post, each matrix number generally refers back to a one-sided master recording – or at least, a stamper. 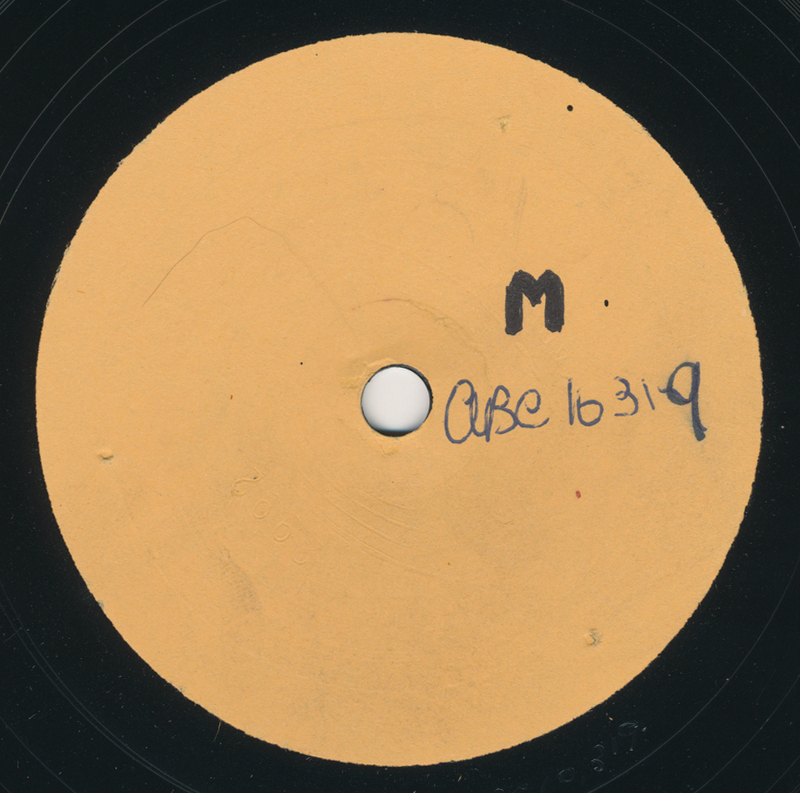 As you can see from the photo, the matrix number of this record also happens to be written in pen on the blank label: ABC10319. There’s one major African record company that used the “ABC” prefix on an abundance of their recordings and that was Gallotone (and its subsidiary label, Trek), the most well-known African independent label, which was based in Johannesburg and founded by Eric Gallo. Could this record be from the same session? Was it ever issued? Of course, it’s important to remember that these questions should have no bearing on our enjoyment of the music. In fact, perhaps they even bog us down. Perhaps they say more about our need for mystery than anything else, or our need to compartmentalize various musical styles. Or, our need to equate a recording with a price tag on the open market, enabling future collectors to fetishize it. Part of what I enjoy about these anonymous (for now) recordings, is that they have the potential to challenge our assumptions about their origins, language, style, and worth. It’s a flat disc with a scribbled number on it – and yet it can be so much more. That zero could almost be a six (so, ABC 16319), but I have no idea whether any such numerical was ever used, and apart from that rather lame suggestion I have no bright ideas to offer. But I will say that I’ve had a great big grin on my face all the time I’ve been listening to this fine record. So much interesting intricate details are given.The reader will be curious to know where and how the record surfaced.A wild guess, could the ABC indicates African Broadcasting. Hi Jonathan, the recording date for this ABC number is probably around 1951, but could be as late as 1953.